One of things my kids do that drives me crazy, besides leaving the refrigerator nearly empty, is frequently dredging up past experiences from their memory. At least once a day, a child recalls a -- in their mind -- tragic experience from months or years ago in their goal to render a sibling or parent inert with guilt. For instance, my second oldest daughter likes to bring up the moment when her fingers got slammed in the car door by my oldest daughter while we were at Disney World -- an event that took place seven years ago. Another memory to come up on a regular basis is a retelling of a time someone threw up in a place not normally used to contain this type of sick. The most repeated recollection is when one of my kids tried to launch a Buzz Lightyear doll on a firecracker until a Woody toy came alive and spoke to them. Well, at least I think that's one of theirs. We writers tend to do the same thing my children do when it comes to past difficulties, and not just for a memoir or autobiography. In many situations, writers decide to give up on their dreams because of events that took place in the past. For example, a series of rejections, harsh critiques of their work, or a seemingly endless period of writer's block. When asked why they slowed down or gave up writing, these folks bring up the past discretions as valid reasons. Of course, these excuses smell worse than a windowless room full of people who just consumed five-bean chili on a hot day. Writers need to get past their previous problems and focus on what's going on in their present and the future. Just because their works were rejected before doesn't mean the process will continue, especially after editing and rewriting. Same thing for writer's block, which can clear up with a mere whisper of a suggestion of an idea from something noticed on the sidewalk. In other words, though it's somewhat cliché, a new year means a clean slate. And the best way to clear this slate is to take problem projects from the year before and file them away in a computer folder or file cabinet. They can be pulled out once the writing mojo returns in force. And as soon as that takes place, writers can look forward to their next project, book signing, or appearance on Jimmy Fallon's Tonight Show rather than utilizing their mental time machine to relive the past. Do you look to the problems of the past or the brightness of the future? We have no control over the past or the future. Sure we can plan, wish, hope, but we must write in the present. Our writing takes us forward to the future, back to the past, or somewhere in between. I try and stay present with what I am writing. The rest will happen when it's time. I'm so sorry to hear that one of your children had her fingers injured and that someone else got sick unexpectedly. Sometimes negative experiences can stay with someone in that they help them to be better prepared for the future. 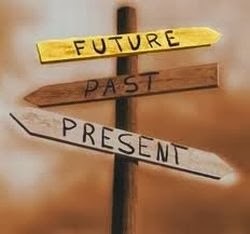 So while I wouldn't dwell in the past, I think that the past offers a wealth of lessons that can help me in the present. Although it's fun to remember funny incidents that weren't funny when they happened such as my dad's skiing accident when he badly twisted his knee, I try to look to the future whenever possible. I'm not against bringing up the past. It gives us something to talk and write about...and sometimes we just need to get things off our chest. But it can also, as you point out, be a road block in our writing or even relationships. We all have past experiences that we use as "roadblocks" to accomplishing something in the present or to looking to the future. But you're right--at some time, we must move on. Great post, Rich!